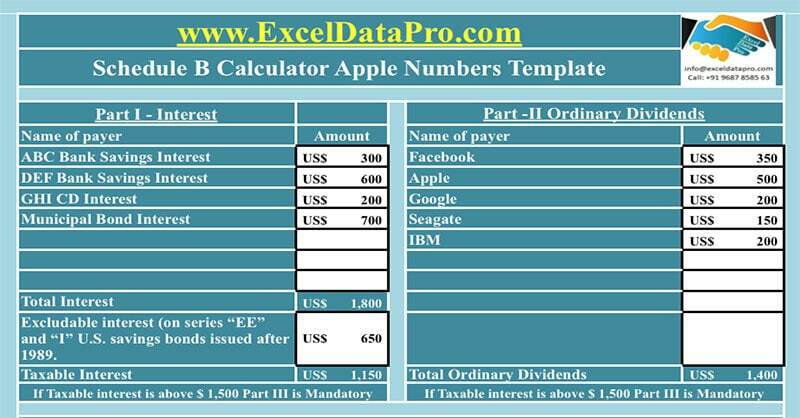 Schedule B Calculator Apple Numbers Template is a tool used for federal income tax calculations. This template helps to calculate your taxable interest and ordinary dividends that a taxpayer receives during the tax year. This template has been made for our readers who use Mac operating system. Schedule B is a part of Form 1040 and Form 1040A of Federal Income Tax. You just need to enter your income in the form of interests and dividends from the respective sources. Schedule B Calculator Apple Numbers Template will automatically calculate the amount for you. Who needs to file Schedule B? had over $1,500 of taxable interest or ordinary dividends. received interest from a seller-financed mortgage and the buyer used the property as a personal residence. have accrued interest from a bond. reporting original issue discount (OID) in an amount less than the amount shown on Form 1099-OID. reducing your interest income on a bond by the amount of amortizable bond premium. claiming the exclusion of interest from series “EE” or “I” U.S. savings bonds issued after 1989.
received interest or ordinary dividends as a nominee. had a financial interest in, or signature authority over, a financial account in a foreign country or you received a distribution from or were a grantor of, or transferor to, a foreign trust. Part III of the schedule has questions about foreign accounts and trusts. To avoid mistake and for the purpose of estimating your tax liability, we have created and simple and easy to use Schedule B Calculator Apple Number Template. This template can be useful to individuals, couples filing jointly and even freelancers doing taxation work. Click here to download Schedule B Calculator Apple Number Template. Let us discuss the contents of the template in details. 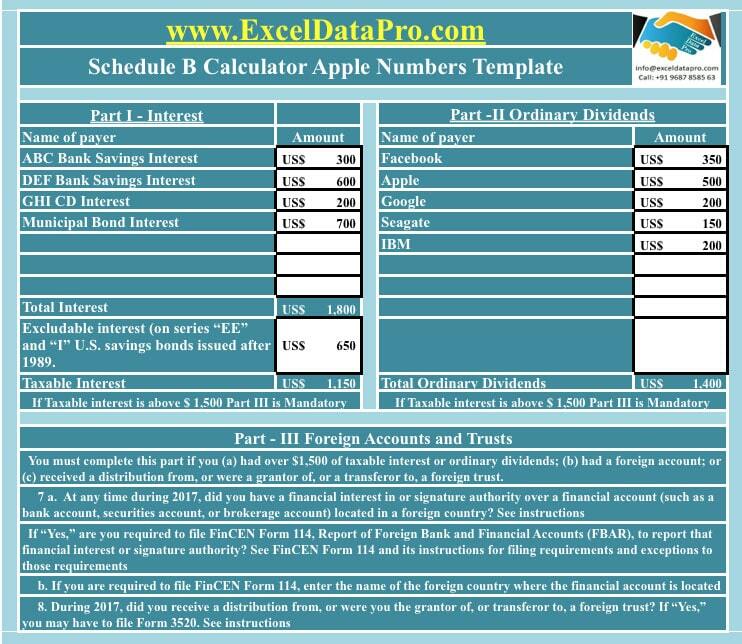 Schedule B Calculator Apple Number Template reports of 3 types of incomes; Interests, Ordinary Dividends and Foreign Account and Trusts. You can also find this Schedule B Calculator as a fillable PDF on IRS website. Click below to download the fillable pdf. 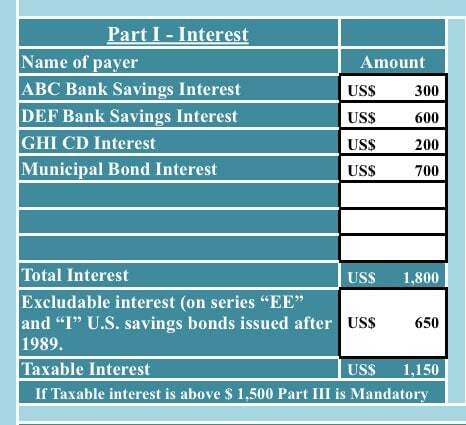 Income from interest from banks and corporate bonds are subject to income tax. The only exception it has is the interest from Series I and EE savings bonds issued after 1989. Banks and companies issuing bonds who paying interests report them in form 1099-INT. The brokerage firm can provide you with Form 1099-INT, Form 1099-OID or such other relevant document. You just need to enter the firm name and respective amount of interests received in Form 1099-INT. Income from dividends is reported in this section. You need to report the name of the company along with the dividend amount in Part II. 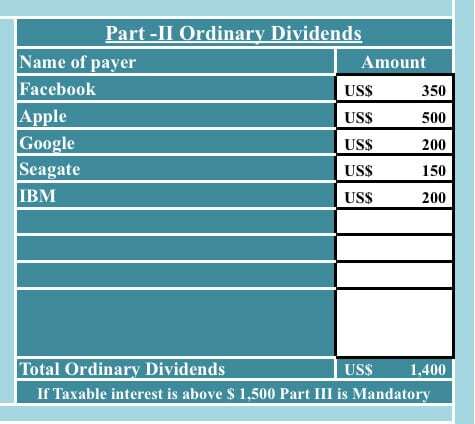 Enter the name of the organization/company paying the dividend and amounts in Part II. The system will automatically subtotal the amount for you. has received a distribution from, or were a grantor of, or a transferor to, a foreign trust. Part-III consists of only yes and no options. Amounts will be reported in respective forms details of which is given below. FinCEN Form 114 must be filed if you have interest from foreign accounts during the tax year. Form 3520 must be filed if you have been receiving a distribution from or were the grantor of, or transferor to, a foreign trust. Disclaimer: Interpretation of the above topic is for education purpose and cannot be considered as a legal advice. It is highly recommendable to consult a CPA or tax consultant.